Hot Flash Heat Wave is holding it down for San Francisco bands at this year’s Phono del Sol Music & Food Festival, a hyper-local, San Francisco tradition going on its sixth year. There’s no better way to spend a summer Saturday than in the sun with friends, gourmet grub, and a beer in hand, but before you head to Potrero del Sol park this Saturday, July 9, 2016, get to know this up-and-coming SF band! If you listen to Hot Flash Heat without wanting to drop everything and head for the coast, you’re doing something wrong. This upbeat garage band produces catchy guitar riffs by the dozen and does so in goofy getups and with grins on their faces. The four-man band captures a dreamy and hypnotic North California vibe with vocal harmonies and groovy beats driving each song. The SF-based group is composed of four friends who have known each other since high school: Adam Abildgaard, Nathaniel Blüm and Ted Davis all manage the vocals and riffs, while drummer Nick Duffy keeps everyone on track with his energetic beats. 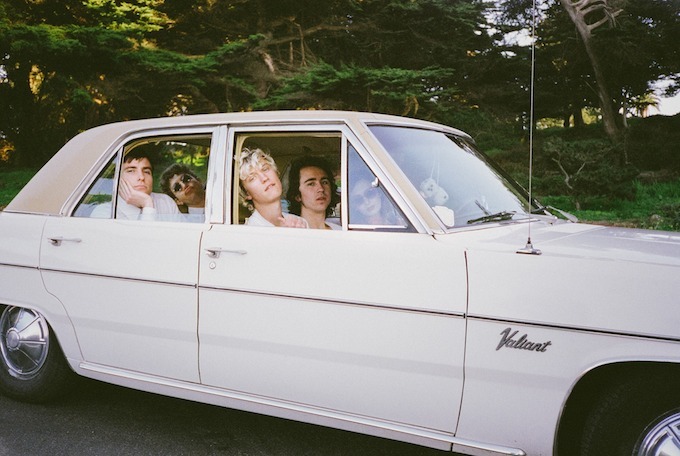 The band has been tearing up SF for several years despite their young age, with many heralding them as the future of the San Francisco music scene. Hot Flash Heat Wave self-released their full length album, Neapolitan, in 2015 and recently announced that they will be signing on with local recording studio OIM Records. The group lives, works, and parties together in the San Francisco, and they want to party with you! Grab your tickets to Phono del Sol and see these guys in their California Summer element.